No, I don’t mean drinking, although depending on the party it is not such a bad idea. I mean pre-eat before you get to the party! By having a little snack before heading to the party or gathering, you won’t be so ravenous and over eat at the buffet. While yes that means make sure you so hello to everyone, what I mean is to keep moving around the room and especially do not get planted right next to the food. We have a tendency to eat without thinking so by limiting our ability to mindlessly eat. Alcohol has a tendency to make us feel hungry, even if we aren’t. Drinking before we have a good base layer of food can lead to big shifts in our blood sugar which can lead to excessive over eating, mood swings, getting intoxicated faster than we anticipated, loss of energy, and a big headache the next day! It is easy to dive right in when we arrive at the buffet line. One of the best ways I have found to maximize eating the foods I want to eat the most is to take a lap. When you get to the buffet, walk around it, see what is there before you make your decision of what you want to put on your plate. This way you avoid putting something on your plate that you only marginally will enjoy. Filling our plate is inevitable when we are at a big function with a nice buffet. One way to avoid overeating is to use the small plates at the table. Then go ahead and fill that plate and if you still want more after then head back for seconds, only after taking a breather (see next tip). That’s right, before you go back for seconds, take a few minutes to breathe. The nerve receptors take a while to communicate the information from your stomach to your brain that you are full. You will still feel satiated from the delicious meal you had, and you will probably even feel better not walking around over full. Your fitness routine may get a little out of whack this time of year, but that is no reason to completely fall off the wagon. Make sure you still get some active movements in. 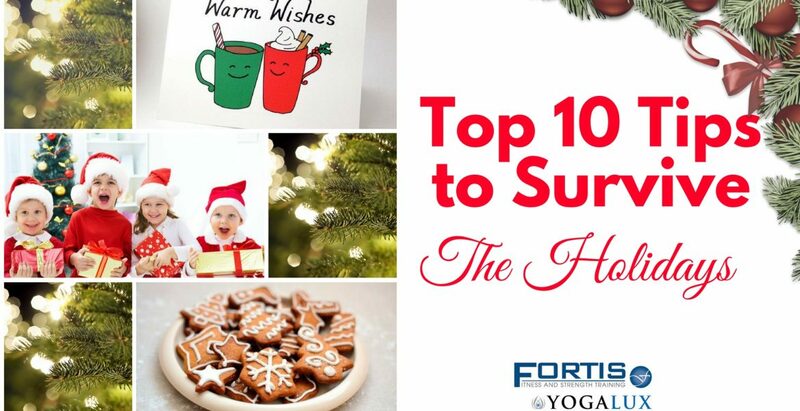 At Fortis Fitness & YOGALUX we like to do fun class challenges during this time of year to keep our members motivated and on their routine. Another way I like to maintain my activity level is to make a hot drink and go for a night walk. This could either be a nice time to share with your out of town relatives, or more importantly could be that time you get to yourself. One of the things I find most difficult about this time of year is the short days. When it gets dark by 4:30pm it makes it hard to stay motivated to do anything after work. One way to combat this is to get your activities done earlier, either before work or during the day. The other way to combat this is to make a plan with a workout buddy or friend to help keep each other accountable. More often than not we eat because we are actually thirsty, now I don’t suggest skipping a meal and drinking water instead, but what I do make sure to do this time of year is keep my water intake up. You will be surprised how much less hungry you are throughout the day. Making sure we drink water between bites at a meal will help limit the overeating, bloating, etc. Even here is San Diego, the winter can have dryer air leading to dried out skin, lips, etc. unless we keep our water intake up. This time of year is supposed to be fun and enjoyable. Don’t beat yourself up if you eat or drink a little too much. Life is all about balance. 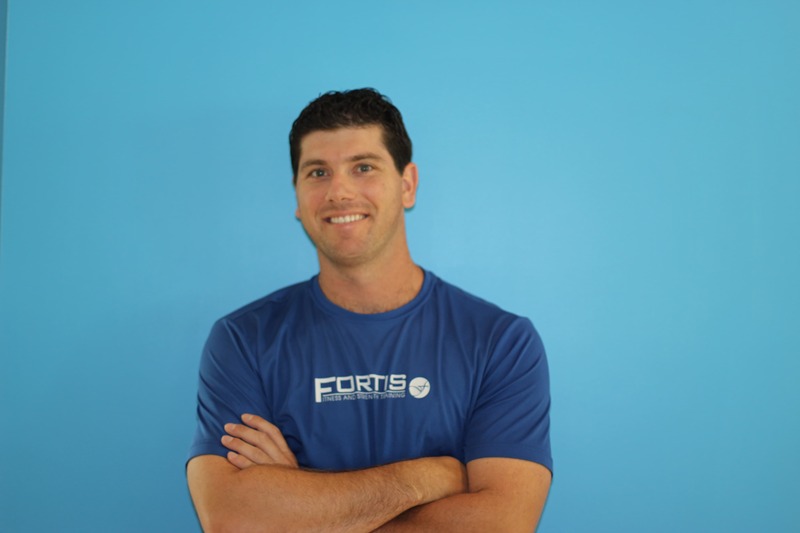 Adam Jacobs is the owner and Founder of Fortis Fitness & YOGALUX. He is a former collegiate and professional baseball player. He was the 3-time team captain and Starting Catcher at Cornell University where he earned a B.S. in Applied Economics and Management and Minored in Communication. He then went on to play baseball professionally in Australia and Hawaii. Having overcome many significant injuries throughout his playing career, he understands what it takes to sacrifice to reach for your goals. He wants everyone to have to their own opportunity to aspire to reach whatever their goals may be and created Fortis Fitness & YOGALUX to help other achieve those aspirations. Many of the pieces of equipment found at Fortis & YOGALUX were used by either Adam or his teammates throughout his career. When not greeting the great members at Fortis & YOGALUX, Adam can be found taking one of the many classes, playing beach volleyball, going for a run, coaching baseball or volunteering in the community at various non-profit organizations.